Passed away November 8, 2018, peacefully, at Knockagh Rise Nursing Home, beloved husband of Laura, loving and devoted step-father of Laura, adored granda of Kris, Julie and Kyle, and great-granda of Leah and Austin. Funeral Service in Irvine's Funeral Home on Sunday at 1.30 p.m. and afterwards to Victoria Cemetery. 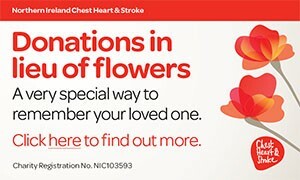 Donations in lieu of flowers, if desired, to Alzheimers Society c/o S & J Irvine, 31-35 Irish Quarter South, Carrickfergus (cheques made payable to above charity). Will be sadly missed by his loving wife, step-daughter and family circle. these are the memories he left behind. I am sorry to tell you that John McKeown HANNA has passed away.